This weekend I’m going camping. I’ll be getting The Book — “Harry Potter and the Deathly Hallows” — delivered to the campsite via owl. Yep, we’ve made special arrangements. This summer, it’s all about HP and JK (Rowling). From the beginning, I’ve equated the HP series with the struggle against fascism and prejudice. I’ve seen Lord Voldemort’s rise as a parallel universe to the rise of the Bush administration and ultra-right control of all three branches of government (until last year’s election). Dumbledore (and the Sorting Hat) exhorts Hogwarts students to stick together in the face of Voldemort, who thrives on division, and to reach out to students from other lands. Dumbledore says to always stand up and fight prejudice and treat all beings as equals. These messages make my heart swell with love for this series and author. Promoting literacy and reading is always part of the conversation about Harry Potter. The series makes reading cool among the younger generation, say the pundits — and teachers and librarians. Reading is so fundamental to progress that it has taken a struggle — and it continues to take a struggle — for a completely literate society. In this time of YouTube and sound bite communications, reading and writing musn’t be forgotten. The struggle for literacy is a theme of one of the People’s Weekly World’s recommended summer reading books in this week’s issue. Reading, action and unity are three themes that the People’s Weekly World/Nuestro Mundo shares with the Harry Potter series. You will find in this newspaper’s pages actions and struggles of ordinary people, organizing and sticking together through thick and thin, because they want to do what’s right: people of all races and backgrounds, acting together against hate and racism, for worker and immigrant rights, for equality for all. You will read about — and be moved to act — to end the ongoing criminal war in Iraq. To join with all those, including our many allies in Congress, who say it is time to start bringing the troops home. This newspaper keeps you connected to the struggles, large and small, and is your tool in the fight for peace, jobs, equality and a better world. This is the newspaper with the big and long view of social change that also sees the need for a system that will put people and the planet before profits. That system has a name — and it’s not capitalism, it’s socialism. Reading, unity and struggle — in Spanish and English — could come to weekly to your home or office for just $30 when you subscribe. That $30 is more than just a subscription — it shows your commitment to reading, working-class unity and struggle. Long after the hoopla surrounding Harry Potter has died down, the need to struggle for dignity and justice will continue. With your help, the PWW will be part of that struggle too. 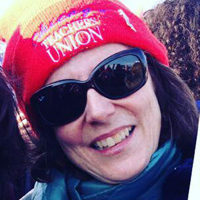 Teresa Albano (talbano @pww.org) is editor of the People’s Weekly World.